Estimated running time: 90 minutes, presented without intermission. Photo of Patrese McClain, Alexis J. Roston, Leah Casey, Melody Angel, Angelica Katie, Melanie Brezill, Melissa DuPrey, and AnJi White (Joe Mazza). 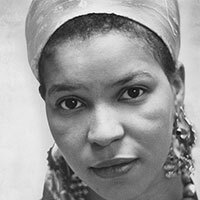 Monday, April 8: A reading of Ntozake Shange's choreopoem about one night of dreams and memories from a young, African American woman. A series of curated, community-focused events allowing participants to engage with the themes in Shange’s work in a variety of ways.